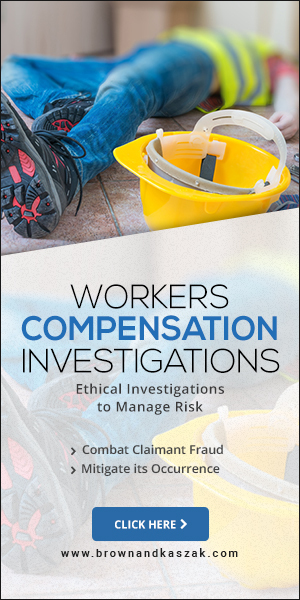 It’s estimated that workers compensation fraud amounts to just over $7 billion per year. A partnership with Brown, Kaszak, & Associates provides you with the ability to build your defense against the growing number of fraudulent claims. We have developed an investigative process designed to gather and analyze as much information as possible in order to ascertain the merits of a claim, and to mitigate the occurrence of fraud. Brown, Kaszak, & Associates leverages a network of investigative resources to manage and deliver investigative services to include claims investigations, fraud and SIU services, and subrosa investigations. Our preferred vendor management program enhances our coverage area and ensures results to exceed your expectations. The benefit to your organization is a single service provider which features standardized rates and ensures compliance. Preferred vendors of Brown, Kaszak, & Associates are held to the highest standards of ethics and integrity, and are carefully and formally vetted to meet our stringent requirements for experience, reputation, compliance, licensing and insurance. The seasoned professionals at Brown, Kaszak, & Associates are well positioned to craft an investigative solution to meet your needs. Contact us today for more information. Activity Checks are an investigative tool designed to gather information about the subject of the investigation that may prove beneficial in future surveillance efforts. For example, an activity check may be used to verify the times that the subject of the investigation usually leaves for work in the mornings. Social Media Investigations are an invaluable resource in assisting insurance professionals with identifying fraudulent workers compensation or disability claims. Brown, Kaszak & Associates leverages deep web technology to compile open source intelligence to provide actionable intelligence to insurance professionals, claims adjusters, and third party administrators. In simpler terms, when this investigative resource is employed as soon as possible in the investigative process, the expert analysts at Brown, Kaszak & Associates can compile and analyze social media photos, posts, videos, blogs etc. to develop a profile of activity before a reported loss, in parallel with the loss, and for a period after the loss. A shoulder injury reported at the workplace on Monday could be identified as a shoulder injury sustained recreationally over the weekend via social media posts. Medical Canvass is an investigative method designed to gather and analyze specific detailed information that may assist in identifying the existence of a pre-existing condition. Through legal and ethical means, the medical canvass can determine if the claimant received treatment prior to the date of reported loss, determine the existence or propensity for injury claims, identifies undisclosed medical treatments received by the claimant, and assesses whether or not the injury occurred outside of the course of employment. Wellness Checks are an investigative method consisting of a face to face interview with the claimant. During this interview information is obtained to assess the overall health and well being of the claimant, and to verify as much information as possible about the claimant including which doctors they visit and how often, employment status, personal information, relatives, the presence of any evidence contrary to the claim such as photos showing physical activity previously reported as restricted, or equipment or tools that can’t be used due to an injury. Subrosa investigations are what is commonly known as covert surveillance. Derived from the latin phrase “under the rose”, where it is commonly understood that throughout history, the rose is considered a symbol of secrecy. The investigators at Brown, Kaszak & Associates are highly regarded for their ability to obtain video evidence. Doing so is not a matter of luck, but rather the result of obtaining as much information as possible about the subject of the investigation prior to surveillance, and implementing a plan of action with the sole purpose of obtaining the video evidence necessary in defense of a fraudulent claim.